Kanchenjunga Trekking is one of the most beautiful trekking trails in Nepal. The trek takes you to one of the mountain massifs in the world, Mt. Kanchenjunga. Kanchenjunga means ‘Five Treasures of the Great Snow’ in the Tibetan language. They denote the five summits that makeup Kanchenjunga range. 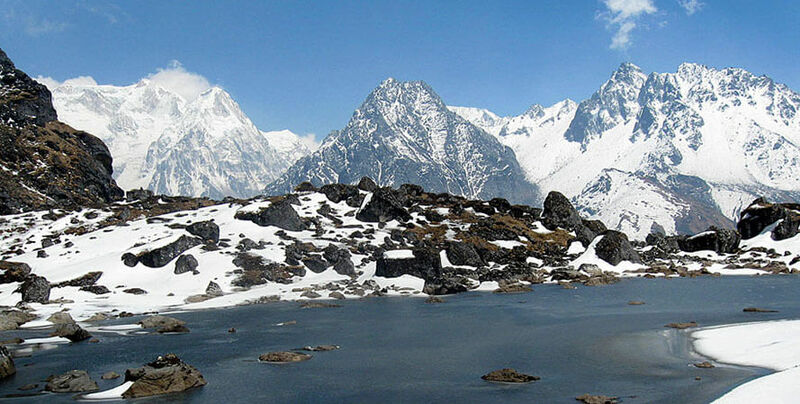 Kanchenjunga Trekking is an unspoiled trekking trail in eastern Nepal. It is a restricted trekking region. 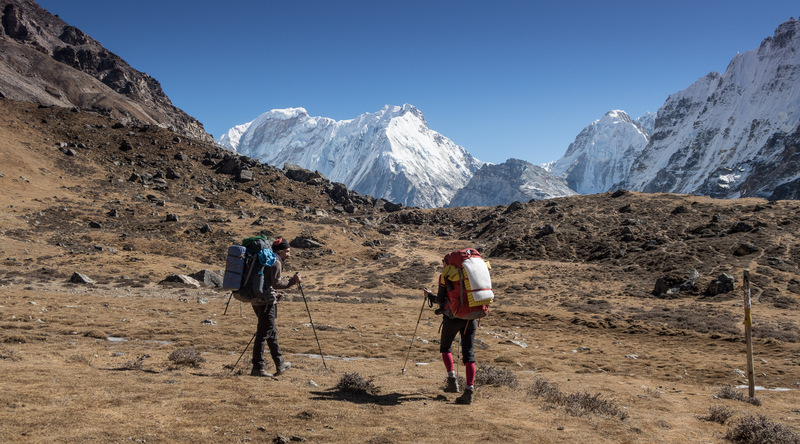 You must trek with a local guide and at least 2 trekkers. This is the most follow rule set by the Government of Nepal. The trail to the Kanchenjunga Base Camp trek is less crowded. The trek rewards the trekkers with a unique insight into the remote part of Eastern Nepal. Also, you can witness the rural lifestyles in the region. Trekking in Kanchenjunga offers the most beautiful Himalayan scenery. You will see the best views of Mt. Kanchenjunga, Mt. Makalu, and Jahnu Himal. You will also see towering heights of Mt. Rothang and Kabru above a moraine on the Nepal-Sikkim border. During the trek, you will see the gradual changes in the landscape. The trek offers diversified vegetation and wildlife. 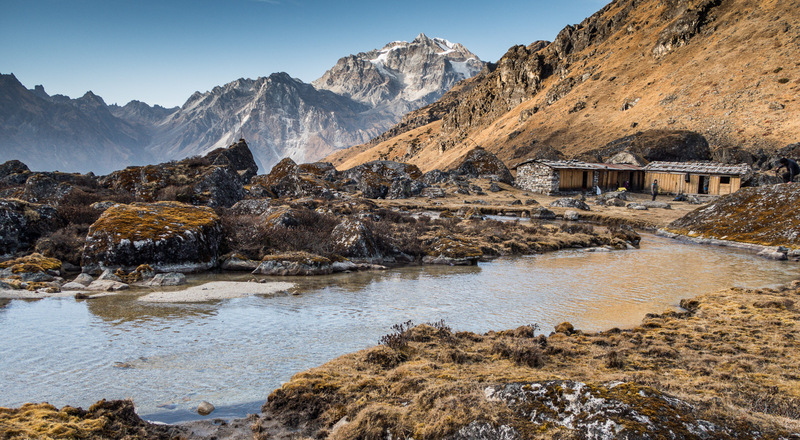 On the trek, we will pass through the protected areas of the Kanchenjunga Conservation Area. We can see several wildlife and birds like pheasant, dragon, snow leopard, black bear, red panda, etc. The trek route passes through Himalayan coniferous forests, alpine shrubs, meadows, and grasslands. The natural beauty is mesmerizing! The trail is culturally rewarding. Along the route, we will encounter mixed cultures, ethnic communities, and tribes. The trek is a combination of the tea house and camp trekking. This adventure rewards you with amazing memories to cherish for a lifetime. Magnificent views of Mt. Kanchenjunga, Mt. Jannu, Mera Peak, and many others. The beautiful remote villages in the Kanchenjunga region. Exploration of both Kanchenjunga Base Camps. 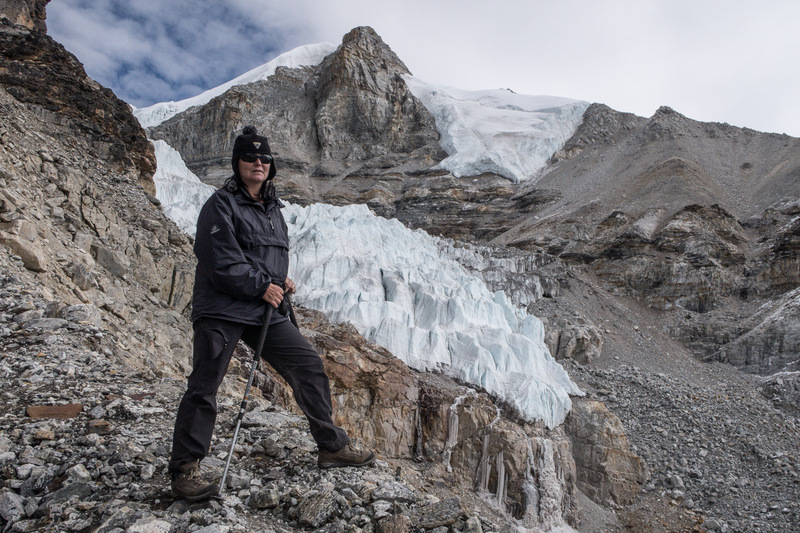 Experience of walking over the glaciers. Pristine Rhododendron forest and the high alpine passes. The settlements of Tibetan refugees on the Kanchenjunga Trekking Routes. Wildlife species in Kanchenjunga region like musk deer, snow leopard, blue sheep. Spring (March, April, May) and Autumn (September, October, November) are the best time for Kanchenjunga Trekking. During these times, the weather and temperature are more favorable for trekking. So, you will have comfortable trekking. Kanchenjunga Trekking is doable throughout the year. But in monsoon, the frequent rainfall adds complexities to the trek. In winter, the region is very cold. So, Kanchenjunga trekking in off seasons is doable, but it is very difficult. The Kanchenjunga Trekking is a long duration trek. Trekkers often feel exhausted in the middle of the trek. So, be mentally prepared before you go. The trek isn’t easy. There are frequent ups and downs. Some are very steep and risky. Be careful, be safe. During some days, you will have to walk for 8 to 9 hours. For that, you will need a fit body and a healthy mind. You can get some physical training before you go. Make sure that you can walk for 7 to 8 hours a day. There are various sections on the trail with the possibility of landslides. Mainly in the rainy season and in winter, you must fear landslides and avalanches. While walking through tough sections, you might feel low in energy. Many trekkers feel that. So, get some energy bars or chocolates. Be careful while ascending or descending over the glaciers, and other rugged sections. You might get injured in these sections. The Kanchenjunga Base Camp is a high altitude trek that starts and ends in Kathmandu, 1300 meters. From Kathmandu, we fly to Biratnagar, 72m. From Biratnagar, we ascend to Suketar (Taplejung), 1442m. The altitude at Mitlung is 921m. From Mitlung, we start gaining altitude gradually. We trek to Chiruwa 1270m, Sekathum 1660m, and to Amjillosa 2510m. From Amjillosa, we ascend to Gyabla 2730, Ghunsa 3595m, Kambachen 4100m, and Lhonak 4785m. From Lhonak, we trek to the highest point, Pang Pema Base Camp, 5100m. Ramtang is at 4370m and Sele Le is at 4300m. The high pass Mirgin La and Tseram sit at an altitude 4870m. We return via Ramche 4610m, Torondin 2995m, Yamphudin1692m, Khebang 1915m, Sinam. From Sinam 1500m, we will drive to Ilam 1208m and then fly to Kathmandu. Day 16: Trek Sele la, Sinion La Pass, Mirgin La Pass, Sinelapcha La Pass and Tseram (3,870m). Day 21: Trek to Khandembe (1,420m). You will arrive at the Tribhuvan International Airport in Kathmandu. Our representatives will be there to receive you. They will transfer to your hotel in a private vehicle. You will have your time to settle in and freshen up. You might feel tired after your long fight. Get some rest till the evening. Strolling around the streets of Kathmandu in the evening is enjoyable. Get a good sleep at your hotel after a nice dinner. Today, we will invite you to visit our office. There we will have some briefings and discussions about the trek. You will also meet your trekking guide and other partners. We will help you process for the trekking permits. You need Conservation area permits and the special permits. After the arrangements, you can set off for sightseeing around Kathmandu Valley. Visit around the Pashupatinath Temple, Swayambhunath Temple, Boudhanath Stupa, or Kathmandu Durbar Square. These are the cultural UNESCO World Heritage Sites in Nepal. Explore the local area, you can take an evening walk to popular streets in Kathmandu. Thamel is one of the major business hubs in the Kathmandu valley. Today, we will take a domestic flight from Kathmandu to Bhadrapur. The Bhadrapur airport is 621 km far from Kathmandu. It takes 45 min to reach Bhadrapur from Kathmandu via flights. The airport is also called “Chandragadhi Airport”. Bhadrapur is the gateway to India from south-eastern Nepal. Also, it is the gateway to the various tourist destinations in the Himalayas. Bhadrapur is the place where we start our trek to the Kanchenjunga region. You will see big markets in Bhadrapur. This place has good services like proper education, transportation, and health services. In Bhadrapur, there are Police and military headquarters as well. Bhadrapur is famous for its rice cultivation. You will see large numbers of rice mills there. Overnight in the ‘Tea City of Nepal’, Bhadrapur. We drive from the flatland of Bhadrapur towards Taplejung via Mechi Highway. We will start driving towards the green hills of Ilam. Ilam is called as the Queen of Hills. You will see lovely hills with a temperate climate, fertile lands. The low green hills and the tea cultivations make a beautiful scenic view. Now, we drive towards Taplejung via Phidim. Enjoying the beautiful sceneries, we will drive up to Suketar. Suketar is the point where the actual trek starts tomorrow. Note: If you want to skip this driving journey, you can fly from Biratnagar to the Suketar Airport. But the airport is going under some maintenances, and hence is not operated nowadays. Today is our first day of actual trekking. After a morning breakfast in Suketar, we will set off to Chirwa. The trekking starts with a downhill walk to Mitlung. We will start following the Kanchenjunga trek route. The trail takes us through the scenic pastures and small villages. We will cross the Hungdewa Khola and the Tamur River on the way. Trekking further towards Mitlung, we will follow the east bank of the Tamur river. The trail gradually dips and rises along the riverside. We will walk through the striking rocky fields and landslides. We will trek into the valley of Limbu people in Mitlung. We will take a short break at Mitlung. From Mitlung, we start trekking uphill for some time. After the uphill is a gradual descent to the Sinwa village. Sinwa is a small village where you will meet lots of cheerful local people. From Sinwa, we continue to Tawa. From Tawa, the trail is again an uphill climb. Following the uphill and downhill trail, we will meet a wooden bridge at the Thiwa Khola, 1140m. We will cross the bridge. On continuing through the trail, we will enjoy the great surroundings. We will walk along the riverbank of Chirwa Khola and arrive in Chiruwa. Chirwa is a small Limbu village with a few lodges, shops, and campsites. Today is a long day. We will start after early morning breakfast at Chiruwa village. We will follow the narrow trail that winds towards the north of the village. We will walk along the east bank of the Tamur River. The trail will take us into a Chhetri village in Tapethok, 1320m. This village has the Kanchenjunga National Park checkpoint. Show your permits there. Leaving behind the village, we will cross the Simbuwa Khola. This river originates at the Yalung glacier. The trail drops down to the Tamur river. We will walk a few ups and downs beside the river. We will cross a suspension bridge over the confluence of Ghunsa Khola and Tamur river. From there, we will walk along the steep to a riverside campsite. On walking further, we will reach the Tibetan village of Sakathum, 1640 m.
After taking a break in Sakathum, we will continue to trek towards Amjilossa. On the way, there are some stone steps that climb to a tiny village of Ghaiyabari, 2150m. The trail also passes through a gorge after a climb from Solima. Be more careful! Following the uphill and downhill tricky trial, we will arrive at Amjillosa. Amjillosa is a Tibetan settlement. 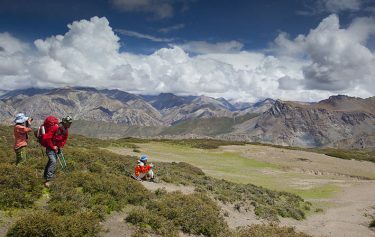 At Amjolossa, we will see Sherpa and Tibetan people. The high altitude favors their lifestyle. Today is an easy day. The walk is relatively shorter than the other days. After having a nice breakfast in Amjillosa, we will set off towards Gyabla. From Amjillosa, we continue to climb along the Ghunsa valley. The trail is far from the reach of human settlements. You will not see any villages while trekking along the trail. We will walk through a dense forest. Climbing up the trekking trail through the dense forests is a beautiful experience. We will feel close to the mountains as we climb up and meander along the forests. Most of the forest has Bamboo, Rhododendrons, and Gnarled Brown Oaks. After climbing the uphill through the forest, we will arrive at a flat ridge. From there, we can get amazing views of the mountains. Along the trail, we will see the scattered pastures and several waterfalls. The climb to Kyapart is steep. The Ghunsa village sits in the middle of terraced hills. The village is at about 350m up from the Ghunsa Khola. Rejoice the sceneries of terraced fields, streaming Ghunsa Khola, and distant landscapes. After walking for some time, we will reach the small Gyabla village. Overnight in Gyabla. Today, we will cross the 3000m elevation threshold. The day begins with a steep descent into a gorge. After the descent, we will walk through the forests of Rhododendrons and Firs. The walk becomes easier now. Following the riverbank, we trek to the beautiful Yak pastures in Pholey, 3210m. Pholey is a Tibetan village with beautiful potato cultivations. We will stop at Phole for a relaxing lunch break. At Pholey, we can witness the influences of the Tibetan Buddhist culture. Also, there is a beautiful monastery in Pholey. Above Pholey, the valley widens up. The trail now passes through the green fields and larch forests. On following the trail, we will descend down to the riverbed of Ghunsa Khola. After crossing the bridge over the Ghunsa Khola, we will enter Ghunsa village. An overnight stay at Ghunsa inside a tent. We have been traveling for 9 days already. It’s now time for us to take rest. Today is our acclimatization day in Ghunsa village. During high altitude treks, we must get our body adapted to the changing atmosphere. The amount of oxygen in the air reduces as we trek to the higher elevations. So, we are prone to acute mountain sickness. So, we schedule an acclimatization day after a certain altitude gain. We will stay active by hiking up to the surrounding ridges. We will hike up through the lush forests to the Lpasan La Monastery. After enjoying some time there, we will descend back to Ghunsa. 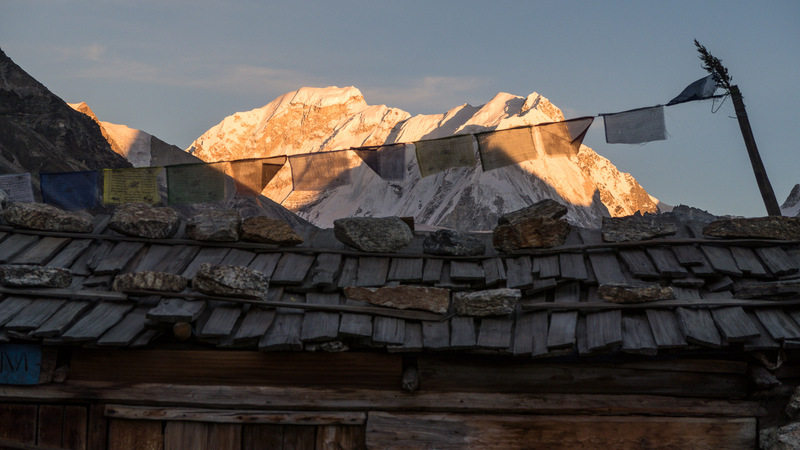 Ghunsa is the last permanent settlement on the Kanchenjunga Base Camp trek route. We will spend some good times in the afternoon at Ghunsa. The trail from Ghunsa all the way to Kambachen is prone to landslide. The trail passes through the off beaten trails of Kanchenjunga North. 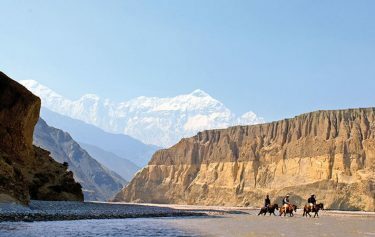 Heading north from Ghunsa, we will trek through the spectacular terrain. The trail makes a gradual ascent through a forest of larch and juniper. We will walk along the east bank of the river. We will also encounter some beautiful meadows along the trail. We will walk over the sandy, the boulder-strewn riverbank path. We will cross a wood and stone bridge over a river to reach Rambuk Kharka, 3720m. Right after Rampuk Kharka, the trail passes through a waterfall and landslide section. Be careful! After the hard walk is an enchanting view of the north face of Mt. Jannu, 7710m. We glimpse the Jannu Glacier as well. Rejoicing the splendid surrounding vistas, we descend through the mountainside. Finally, we will arrive at Kambachen. Kambachen is a temporary settlement with small stone teahouses. These places serve as lodges for Kanchenjunga trekkers. In summer, it is the shepherd’s settlement. While staying in tea houses, we must compromise with our comfort. The facilities are basic. Camping is better than staying in the teahouses. We will camp at the base of Jannu Glacier. From the campsite, we will see a magnified view of Kanchenjunga massif and Mt. Jannu. The trail now enters a desolate landscape. We will make our way above the terrains carved with icy blades of the high altitude glaciers. There are no villages or houses on the trail. The trail climbs gradually through moraine debris. Be careful! Your feet may slip over the iced stones. Walk slowly! The path climbs across the slopes of landslides. We will reach the beautiful pasture area in Ramtang, 4350m. The Kanchenjunga glacier starts around Ramtangat. We will come across the beautiful Ramtang Monastery. The Monastery sits next to the bridge after a waterfall. The vista is amazing. The trail continues along the north bank of the river. We will cross over the Lhonak glacier. The junction of Lhonak and Kanchenjunga glacier is a remarkable place. Maintain a speedy and steady pace. The trek is difficult. After the difficult section, we will see stunning mountains surrounding us in all directions. 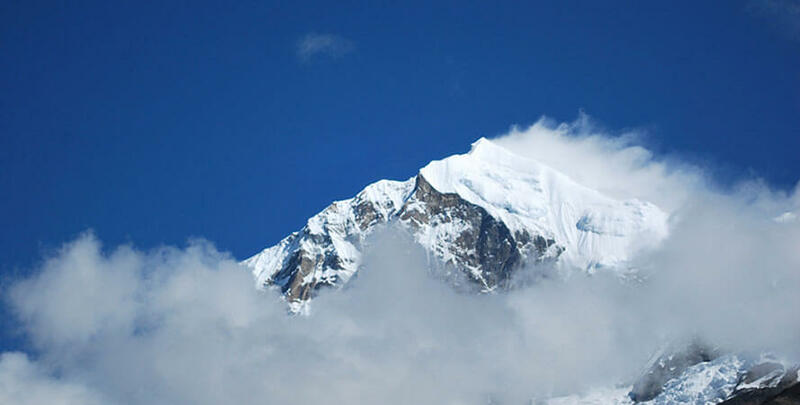 Towards the east is the mesmerizing Mera Peak, 6344m. Enjoying the majestic Himalayan panorama, we will follow a short downhill trail. We will arrive at the Riverside now. After a while, we will see the settlement of Lhonak. Lhonak is a tiny settlement with only three or four small stone teahouses. After walking further, we will arrive at our campsite at Lhonak. Lhonak sits beside a wide and open sandy plain. The campsite in Lhonak is a big grassy plain. Lhonak offers excellent campsites. There are possibilities that we may see some wildlife. We may see the blue sheep, mountain goat or smaller animals in the rocks like hyrax and marmots. We will also see the eagle, kites, and falcons. We will stay in our tents for an overnight stay. Accommodation is better on a tent than in the teahouses. Pang Pema is the local name of the Kanchenjunga north base camp. Today, we will visit the north base camp of Mt. Kanchenjunga. Hiking to the base camp is the best experience. We will climb gradually through the trail. We will follow the line of the moraine. There are some portions on the trail that are prone to landslide. Be careful while walking. Using the trekking poles will make the walk easier. After all the rocky sections are the flat grassy plain basin of Kanchenjunga North Base Camp. Enjoy the views of the towering peak of Kanchenjunga. 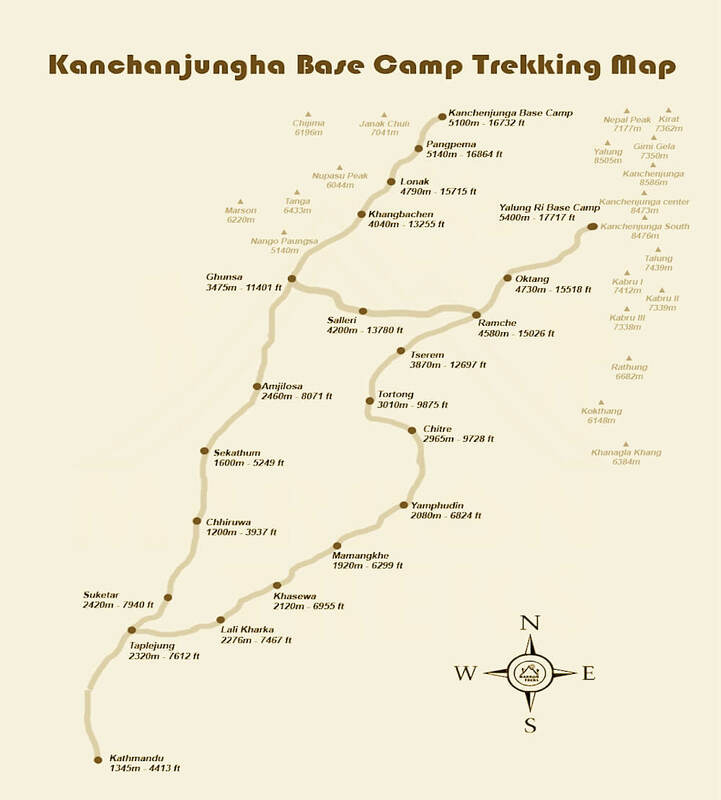 Today, we will explore the Kanchenjunga base camp area. We will hike to the nearby ridge to see the beautiful Himalayan views. We will see the best of Mt. Jannu, the North Face of Kanchenjunga and the Chang Himal. The area is less visited. So, you can enjoy the serene and tranquil atmosphere. Explore the jaw-dropping vista of the glaciers. We may meet with some climbers who are there to attempt the Peak climbing. 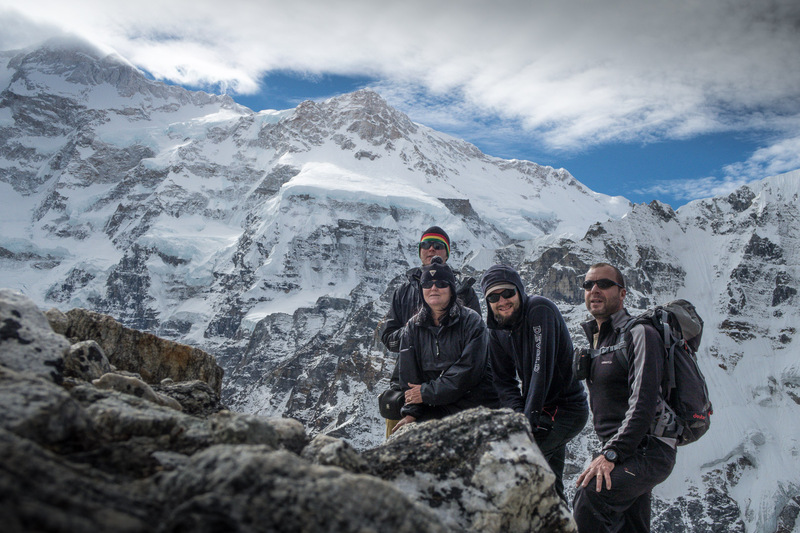 The climb requires an extra four days after reaching the base camp. Also, there is no need for any other climbing permits to climb Mt. Kanchenjunga. It’s now time to say goodbye to the north Kanchenjunga Base Camp. Retracing our previous days, we will trek to Ghunsa. On the way, we will rejoice the splendid Himalayan vistas. Also, trekking from the previous route with a different perspective is a beautiful experience. Enjoy the marvelous sceneries around, we will trek back. Leaving behind the splendid views of Mt. Jannu, we will trek back. Be careful walking around the landslides, and over the glaciers. From Pang Pema, we will trek down to Lhonak, Kambachen, and to Ghunsa. Overnight in Ghunsa. From Ghunsa, we divert towards the right-hand side leaving the trail to Gyabla. The trail is a steep uphill trek to Sele Le. This section is also isolated from human settlements. Most of the trail passes through the dense forest of Rhododendron and Juniper. At Sele Le, there are only one or two small teahouses made up of stones. Lots of travelers claim that they see snow leopards on this section. Do not go far from teahouses at night. Stay warm, stay safe. The views are often crisp and clear in the early morning. We will hike up the ridge north of Pangpema. Enjoy the panorama of the enchanting Himalayas. You will experience a challenging trek today! We will climb 400m to the Mirgin La Pass. During the climb, we will see the magnificent view of Mt. 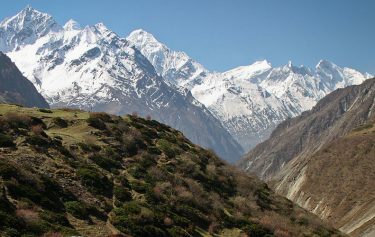 Jannu along with Makalu, Baruntse, Chamlang, Kangchenjunga, and Kabru. We will also see the Himalayan range along the Sikkim border. 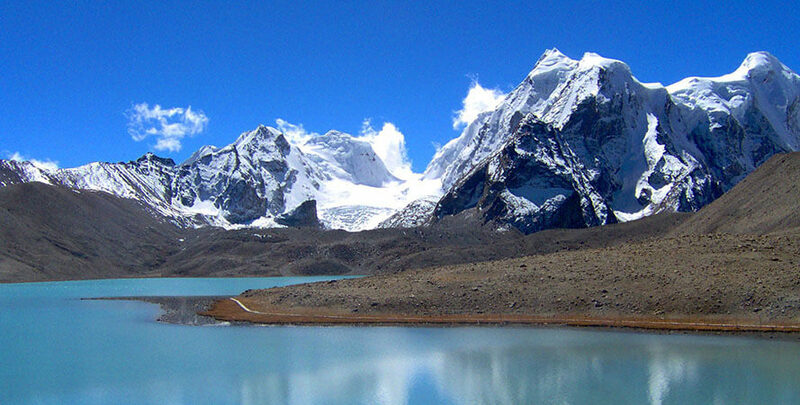 We will trek to the Mirgin La pass and Lapsang La pass, 5160m. By doing so, we will join our trek to the Kanchenjunga south treks. These passes are the high altitude passes. The weather conditions may bring several difficulties here. Be strong! Prepare to see any difficulties depending on the weather conditions. Rejoice the surrounding vistas. They will boost you for further trekking. After a tough day today, we will walk along the ridges with a final descent to Tseram. Overnight in Tseram. 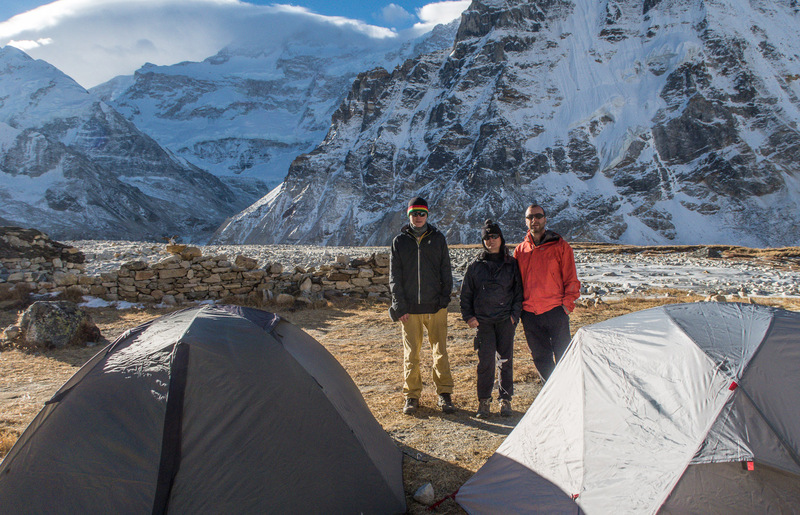 Today, we will explore the Yalung glacier and the Oktang Base Camp. We will start early after a warm breakfast in Tseram as Oktang is 7km away. Today, we will gain an elevation of 300m. Enjoying the beautiful glimpse of snowy mountains and ridges, we will trek higher. The viewpoint of Kangchenjunga is amazing. We will see stunning views of Mt. Rothang and Kabru on the Nepal - Sikkim border. The view is wonderful. The more you ascent higher, the more and close the vistas get. We will ascend past the snout of the Yalung Glacier. 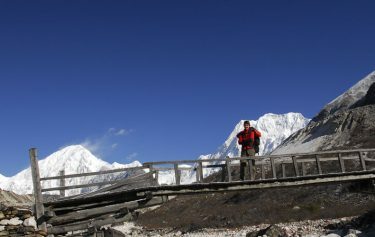 After exploring the alluring features of Yalung glacier, we will hike further. We will walk through a series of ablation valleys. Now, we will reach the Oktang Base Camp, the South base camp. Enjoy the impressive view of Khumbakarna Glacier. The base camp exhibits the most beautiful view of the eastern part of the glacier. We will see magnificent views of the Kanchenjunga south face. Also, beautiful views of the frozen lakes and crystal clear streams appear on our way while we trek. The views of Kokthan, Rathong, and Kabru are today’s highlights. We descend to Tseram for overnight at the camp. 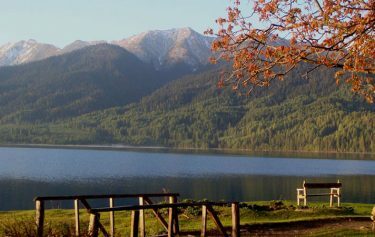 Starting from Tseram, we will see the splendid view of towering peaks Kabru and Rathong. Today, we will trek downhill to the lower altitudes. On walking further, we will see magnificent views of the snowy Himalayas. Enjoy the glimpses of the snow-capped giants ahead of you. 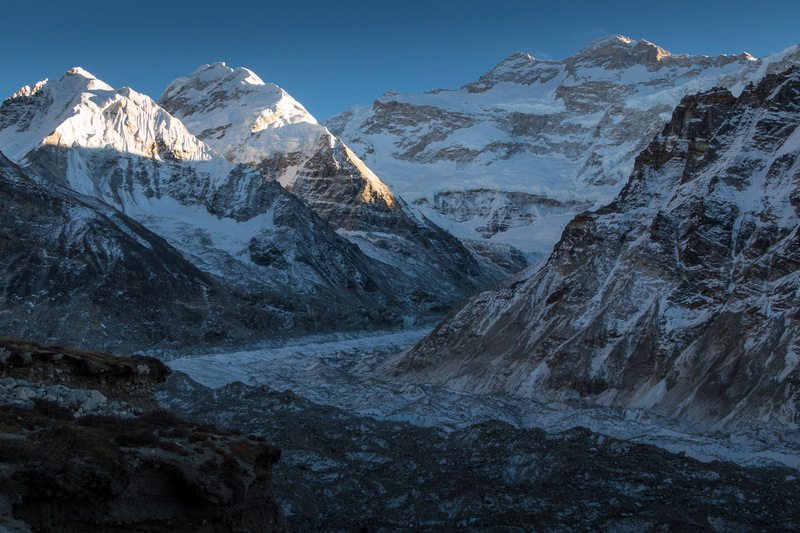 We will see the impressive view of the Yalung Glacier. We follow a steady descent through the forests. Most of the forests are Rhododendron and Pine to Torangden. We follow the easy trail along the Simbua Khola. Walking through the jungles of Pine and Rhododendrons, we will make our way to Torangden. Today is a tough day. The trek comprises of difficult sections. We will trek through the landslide-prone sections. Thus, the hikes are difficult. Be more careful! Along the way, there is a 600m climb to Lamite pass, 3500m. This climb is also tough. After a steep ascent from there, we will reach the valley of the Simbua Khola. Here, we will cross a wooden bridge over the intersecting rivers. We continue ascending the steep and exposed slopes on the way. We will walk into the forest of Pines and Rhododendrons. Walking across Lamite Bhanjyang and Amji Khola, we climb again. There is a pass at Dhupi Bhanjyang, 2540m. From there, the path contours down through the cultivable fields. People grow Corn and Barley there. We will cross a ridge and reach Yamphudin. 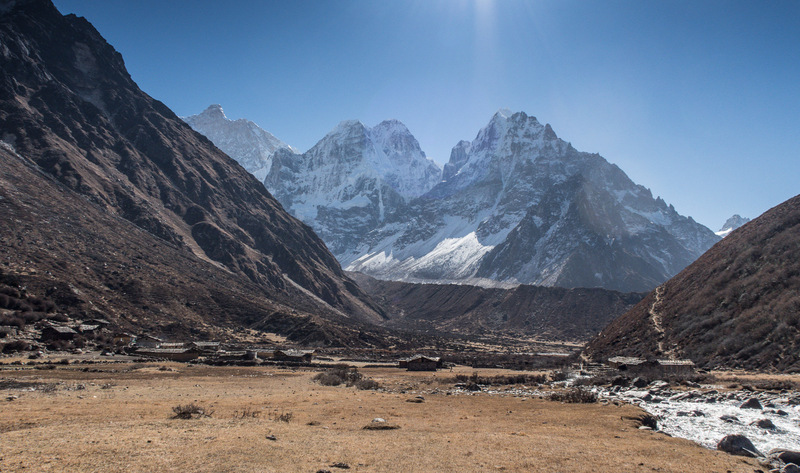 Yamphudin is a mixed community of Sherpas, Limbus, Rais, and Gurungs. It is a beautiful village that we see after we saw one at Ghunsa. Overnight in Yamphudin. We will start early in the morning after a nice breakfast in Yamphudin. The trek passes through the villages of Chhetri and Brahmins. Walking into the human settlements after remote trek is a wonderful experience. Walking through the beautiful trail, we will witness the wonderful landscapes. We will walk into different villages of different ethnicity. We can see their varying lifestyles and cultures. Walking ups and downs through the splendid trail, we will trek to Khebang. We will stay there for an overnight. Today is a long day. Starting from Khebang, we will drop 1000 meters in 6 kilometers. Dobhan is at 6 kilometers from Khebang. At Dobhan, we will stop for lunch. Dobhan is a beautiful place. After a filling lunch there, we will set off towards Khandembe. From Dobhan, it is another 8 kilometers walk to Khandembe. Taking small water breaks at some places, we will trek continuously. Following the straight village path, we will finally arrive at Khandembe. Overnight in a local inn at Khandembe. Today is our last day of actual trekking. On this day, we will climb 1200 meters to the Tharpu Village. Enjoy every step of your walk. You will miss all these memories someday. Recalling the memories of the entire trek, we will reach the Tharpu village. Tharpu is a beautiful village. We will stay here today for an overnight. Enjoy the last glimpses of the Kanchenjunga range. You won’t be seeing the mountain sunsets for a long from now. There is a perfect vantage point at the Tharpu village. Spend a cheerful evening at the village. Bhadrapur airport is 190 kilometers from Tharpu. But the road cuts through many twists and turns. The endless windings are frequent. It takes almost 9 hours to reach Bhadrapur. The ride is tiring, yet rewarding. We will stay at Bhadrapur in a hotel. Prepare for your flight tomorrow. Get some rest. Today is our last day on this journey. We will fly from Bhadrapur to Kathmandu. The flight is a scenic flight. In clear weather, we will see the aerial views of some snowy peaks. The views are impressive. We will land at the Tribhuvan International Airport in Kathmandu. We will transfer you to your hotel. Get rest in a comfortable room. You can stroll around some popular streets in the afternoon. 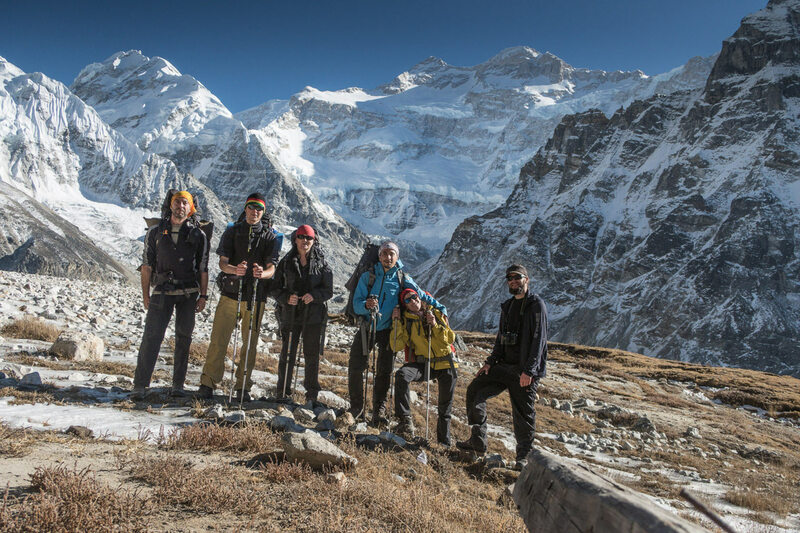 If you have any queries and suggestions regarding our Kanchenjunga Trekking package, please feel free to contact us. Two night Deluxe hotel in Kathmandu on B/B, Before and after the trek, Hotel Access Nepal Pvt. Ltd.
All ground and air transport including Airport pick-up and drop services as per the itinerary. Remote area trekking permit and all needed document. Entry Permit for Conservation Area fees. Guide, Professional, license holder, English speaking. including all his expenses with full insurance cover. All meals, three times a day (breakfast, lunch, dinner, ) Cup of Tea coffe during the breakfast. Tea house accommodation during the trek. First Aid kit box with normal medicine, including Oximeter and pulse meter checker. Emergency Rescue assistance arrangement, paid by travel insurance. Activities in Kathmandu such as Extra night hotel, Meals, sightseeing tour. If you would like to have your private transportation from Bhadrapur - Birtamod -Taplejung. Recommended Packing list for Kanchenjunga Trekking. 2 quick drying long base layer shirts. 2 Thermal underwear – base layer. 3 pair woolen blend trekking socks. 1 camera with, extra batteries. anti nauseant – you tend to feel just a bit nauseaus a lot at altitude. immodium – diarrhea is common at altitued. nasal moisturizer – altitude causes nasal cavities to be very dry, nasal moisturizer was very helpful. Season: September to late December and February to late June. Walking Hour: Approximately 6 - 7 hours each day.